The SIMetrix Simulator - What is it? The SIMPLIS simulator is supplied with the SIMetrix/SIMPLIS product. For information on SIMPLIS see What is SIMPLIS?. In this chapter we explain the analysis modes available with the SIMPLIS simulator. There is more information on SIMPLIS analysis modes including full details of the netlist commands required to invoke them, in the SIMPLIS Reference Manual. 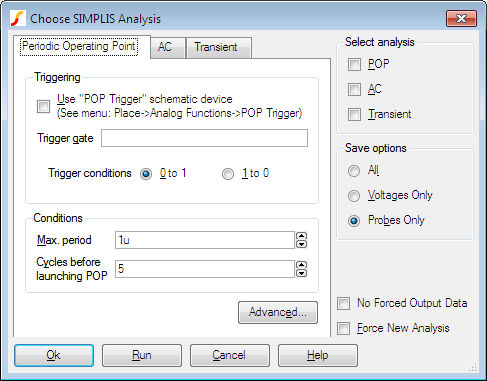 SIMPLIS offers three analysis modes namely Transient, AC and Periodic Operating Point or POP. These analysis modes are described in detail in the SIMPLIS Reference Manual. The meaning of each of the controls is described in this chapter. As with SIMetrix, you can also enter the raw netlist command in the F11 window. The contents of this window remain synchronised with the Choose Analysis dialog box settings so you can freely switch between the two methods.